When students heard that congressman, and democratic candidate for U.S. Senate Beto O’Rourke would be speaking at UTSA on Oct. 4, many awaited his visit with excitement. Some students missed class and waited in line for hours for a chance to hear O’Rourke speak. UTSA failed to accommodate these students who took the opportunity to experience education outside the classroom. While some students were successful in their efforts to attend, others were not. Following O’Rourke’s visit, students unable to see or hear him speak were disappointed that UTSA was not more accommodating. O’Rourke was booked to speak in the Retama Auditorium, which can seat no more than 500 people. When Supreme Court Justice Sonia Sotomayor visited campus last spring, she was also scheduled to speak in the Retama Auditorium. However, the university anticipated that a large number of Roadrunners would want to attend the event, so they made other rooms available to livestream Sotomayor. The university did not provide the same opportunities to those who came out to hear O’Rourke speak. So why didn’t UTSA anticipate O’Rourke’s turnout and make accommodations or schedule him in a room that could hold more people? For instances, The Convocation Center can hold up to 4,000 people. Even if students failed to fill every seat, allowing O’Rourke a larger arena would have given more students the opportunity to interact with the senate candidate. 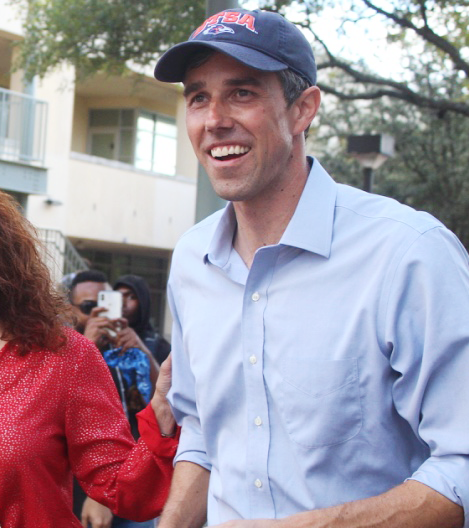 Whether or not students agree with O’Rourke’s politics, enabling more students to engage with a political figure could encourage voter participation. Students who agree would be encouraged to vote in hopes of ensuring the candidate’s seat, and students who oppose would be encouraged to vote in hopes of preventing the candidate from taking office. Either way, more students would be voting. However, UTSA did not expect the turnout for O’Rourke to be so substantial. Even though, as the United States Census Bureau reported, voting turnout for the 18 to 29 year-old age demographic increased 1.1 percent from 2012 to 2016, that same age demographic still has the lowest voter turnout rate with 46.1 percent voting. With this low voter turnout, the university could have assumed that students would not have been interested in hearing a political candidate speak. If the assumption that students would not show up to see a political candidate is the case, then the turnout from O’Rourke’s visit should set the tone for similar events in the future. The university should consider hosting events, such as O’Rourke’s visit, in larger arenas to allow more students to be involved and become active participants in their community.